At the Paris Airshow, Wizz Air signed a MoU with Airbus for the purchase of 110 Airbus A321neo aircraft, with deliveries to start in 2019, and uncommitted purchase rights over an additional 90 A321neo aircraft. The order is subject to a final purchase agreement and approval by the shareholders of Wizz Air, which listed on the London Stock Exchange earlier this year. Such approval is typically forthcoming and the new aircraft should provide significant unit cost improvements. Nevertheless, Wizz Air's order is very large compared with its size today and follows large orders for narrow body aircraft in recent years for other leading European LCCs, including Ryanair, easyJet, Norwegian and Vueling (the latter as part of an IAG group order). Norwegian has admitted that it may not be able to use all of its planned aircraft and Wizz Air's order now provides an opportunity to review the data on the number, and types, of narrow bodies on order in Europe. Narrowbody deliveries to Europe look set to rise, at a time of rising global deliveries. Success is not guaranteed for all. Meanwhile the expanding role of LCCs in both leisure and business markets continues to undermine the positions of legacy airlines on short haul routes. Wizz Air will use its new aircraft both for replacement of existing leased aircraft, when they are returned to lessors, and for growth. Keeping its fleet all Airbus, the MoU gives Wizz Air the right to substitute a number of A321neo aircraft with smaller A320neos and allows the airline to cancel ten A320ceo family aircraft previously scheduled for delivery in 2018. At current list prices, the 110 firm orders are worth more than USD12.5 billion, although, as Wizz Air noted, "discounts will be granted". The size of the discounts is unknown, but could be in the range of 10% to 30%, or possibly more, for an order of this size. Airbus will also be pleased with the importance of the order for the A321neo in Europe. “We looked at different options for this order but Airbus came in with the best overall mix of aircraft, cost efficiency, support and price, so it made sense for us to continue our long relationship with them as we continue to expand our market reach across and beyond Europe,” said József Váradi, Wizz Air chief executive officer. Wizz Air will take its new A321neo aircraft in a 239 seat configuration (with 18-inch between seats). This compares with 180 seats in its existing A320 fleet and 220 seats in the A321ceo aircraft already ordered. The combination of lower fuel burn from the more efficient new engines and the greater seat capacity should lead to significantly lower operating costs per seat. In FY2015 (year to Mar-2015), Wizz Air's cost per available seat kilometre (CASK) was EUR3.61 cent, making it the second lowest CASK operator in Europe, behind only Ryanair. However, we estimate that Wizz Air's CASK was only 2% higher than Ryanair's in FY2015. The A321neo could take Wizz Air below Ryanair in CASK, although Ryanair's Boeing 737MAX order should also keep it on a path to lower unit costs. According to the CAPA Fleet Database, Wizz Air has 62 Airbus A320-200 aircraft currently in its fleet, with 12 more on order. It also has an outstanding order for 27 A321s that will begin delivery in Nov-2015. The airline says that deliveries of its existing orders will continue through mid-2018. This suggests a deliveries at an average of around ten aircraft annually to 2018 and Wizz Air's current orders will take its fleet from 55 aircraft at the end of FY2015 to 88 at the end of FY2018. The airline has not indicated the delivery schedule envisaged by the new order for A321neo aircraft, but it could certainly sustain this delivery rate well into the next decade. Wizz Air's announcement comes at a time when Europe is about to enter a period of increased narrow body deliveries in the coming years. 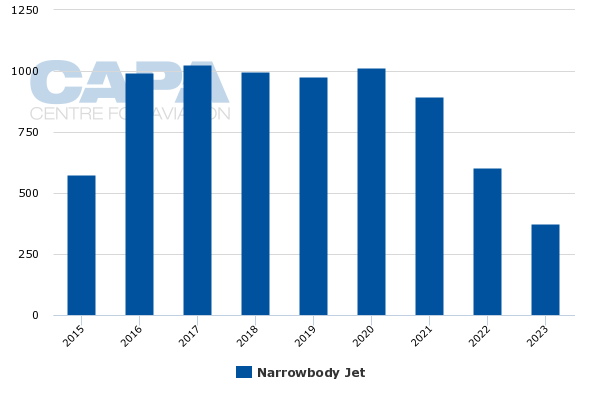 Europe took delivery of narrow bodies at an annual rate of around 200 or more in the period 2006 to 2011, before this rate fell to somewhere around 160 in the period from 2012 to 2014, according to the CAPA Fleet Database. However, the annual rate of narrowbody deliveries into Europe, including options, is to jump to almost 300 in 2016 and to remain well over 200 every year until 2020. Even without options, deliveries of firm orders will be in the range of around 200 to 250 from 2015 to 2020. These projections, which are from the CAPA Fleet Database and take account of all known orders and options, do not include the new Wizz Air order. Moreover, global narrowbody deliveries are also projected to increase. After steadily climbing from 750 in 2010 to 943 in 2014, they are projected to be around 1,000 annually from 2015 to 2020 (based on both firm orders, which make up around 90% of the total, and options). Asia Pacific is a significant driver of the increase in narrowbody deliveries, but Europe is also playing its part. Aircraft are mobile assets and, particularly as lessors play a growing role in their ownership, any surplus in one region can lead to a redistribution of aircraft into another region. Although a significant proportion of orders will be for the replacement of older aircraft, the projected increase in the supply of narrowbodies, both in Europe and globally, raises some concerns about a possible over-capacity situation in the coming years. Narrowbody orders in Europe are dominated by LCCs and by new generation technology (737MAX and A320neo family aircraft). LCCs account for 63% of outstanding narrowbody orders plus options in Europe as of 1-Jul-2015 and this will rise to 66% if Wizz Air's new order is confirmed (source: CAPA Fleet Database). Ryanair heads the leader board by the number of outstanding narrowbody orders in Europe, followed by easyJet and Norwegian (ranking based on the sum of firm orders and options, see chart below). IAG's LCC subsidiary, Vueling, is also in the top ten. Wizz Air's new order will lift is from 13th place to fourth place, ahead of Turkish Airlines, which is the highest ranked full service carrier in this list. Lufthansa is the highest placed among Europe's Big Three legacy groups in this list. However, unlike the majority of the leading airlines by narrowbody orders, for whom growth plans are the major driver, Lufthansa's orders are motivated more by replacement and by the fact that is has such a large narrow body fleet. Besides Lufthansa and fast-growing Turkish Airlines, the only other legacy airline in the top ten is Aeroflot. The Russian airline has also been pursuing high growth rates, although its 69 orders include 22 A320 family aircraft orders that are unconfirmed, according to the CAPA Fleet Database. Among the European airlines with a large number of form orders for narrowbody aircraft, Norwegian Air Shuttle stands out as having the highest number on order relative to its existing fleet. Norwegian's firm order for 242 narrowbodies is almost three times its current fleet at 2-Jul-2015 (source: CAPA Fleet Database). All of the other airlines that make up the top ten by narrowbody firm orders have orders amounting to well over 50% of their existing fleet, higher than the European industry average of 41%, but Norwegian's ratio of orders to current fleet numbers is way out ahead of anyone else. Norwegian has almost as many orders as Ryanair, the leading intra-European carrier, although its current narrow body fleet is only a quarter that of the Irish LCC. Recognising that it will be unlikely to find a use for all of its orders, Norwegian has established a lessor business to find other operators for some of these aircraft. Wizz Air's new order for 110 aircraft, when added to 39 currently outstanding orders, well over twice its current fleet of 62 and will make it second only to Norwegian in the ratio of orders to existing fleet. Moreover, if Wizz Air were to convert its purchase rights over a further 90 aircraft, the ratio would be approaching four times. Wizz Air does have some advantages over Norwegian, including a lower unit cost and a faster growing market in Central and Eastern Europe, where there is also a lower level of LCC penetration than in Western Europe. Nevertheless, this analysis must at least raise questions about Wizz Air's ability to find profitable markets for all of the aircraft on order, especially given the much larger number of seats in its planned A321neo fleet. Perhaps not surprisingly, the most popular narrowbody aircraft, as ranked by total orders and options in Europe, are the A320neo and the Boeing 737MAX-8. The A320neo has 411 firm orders and 140 options in Europe, while the 737MAX-8 has 320 orders and 135 options. These are the new generation engine versions of the very popular A320-200 and Boeing 737-800 and orders for these two types also remain high (see chart below). Before the new Wizz Air order, the A321neo had received only 145 firm orders and 20 options, but will have 255 firm orders and 110 options after the order is approved. This will place the A321neo ahead of the 737-800 for total orders and options and give the top three places to new generation aircraft. The 737MAX-9, larger and longer range than the MAX-8, has only 17 orders in Europe (ten for Turkish Airlines and seven for Icelandair). Together, orders plus options for 737MAX and A320neo family aircraft account for 63% of all narrow body orders/options in Europe. The data from the CAPA Fleet Database that we have presented are thoroughly researched and are based on known orders. However, there is inevitably some margin for error in our projections, particularly when it comes to the detail of precisely which year annual deliveries will occur. It can also be argued whether it is appropriate or not to include options in addition to firm orders. Nevertheless, some clear conclusions can be drawn. Europe is entering a period, that is likely to last for a number of years, in which narrow body deliveries are higher than they have been for five years. New generation aircraft types make up the bulk of the outstanding orders narrow body orders, suggesting that replacement may be an important element motivating these deliveries. However, it is hard to predict the extent to which the orders will be used for the replacement of retired aircraft (as opposed to growth). The higher projected rate of delivery raises some concerns over a possible over-capacity situation, particularly if Europe's economy fails to drive sufficient demand. At least in the short term, this may be exacerbated by the lower oil prices that currently prevail. 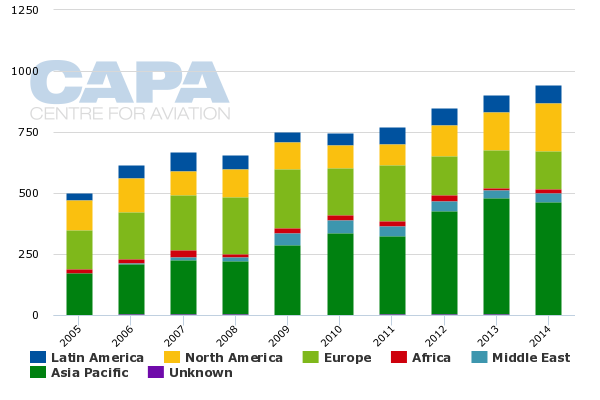 Moreover, the global increase in narrow body orders reduces the safety valve effect of the industry's ability to re-deploy any excess aircraft into other regions of the world. There could even be a risk that other regions might seek to export their capacity surplus to Europe. These broad concerns do not take account of different business models. Narrowbody orders in Europe are largely for LCCs and a low cost base will continue to be important in short/medium haul markets, particularly when unit revenues come under pressure. Successful airlines such as Ryanair and easyJet should be well positioned to continue their profitable growth, thereby using the large numbers of aircraft they have ordered. For Norwegian, the sheer volume of aircraft ordered relative to its exiting fleet appears to be burdensome. It is looking to lease out surplus aircraft, but this may contribute to any market over-supply that might develop. For Wizz Air, the new order looks to be a bold move that could help it to cement its strong position in Central and Eastern Europe. Its successful IPO and first set of annual results as a listed company demonstrated the strength of its business. However, Wizz Air has a very large number of aircraft on order relative to its current fleet. Its shareholders may need significant reassurances that Wizz Air can deploy the new aircraft profitably before they approve the order. The strong imbalance of orders between LCCs and full service airlines points towards an expanding market share for the LCC sector. This must undoubtedly result in the exit from the market of some of the narrowbodies operated by weaker legacy airlines. This would help ease any over-supply, but it will also support the growing power of LCCs on short haul routes. The stronger LCCs will continue to take market share in Europe from legacy airlines, particularly the smaller and less well capitalised companies. As the larger LCCs increasingly target Europe's business markets, thereby depriving the higher cost legacy spokes of their yield margin, tipping points will be reached, route by route. Michael O'Leary's not so tongue in cheek suggestion that Ryanair should become the feeder airline on the hub carriers' short haul spokes starts to come more clearly into focus.